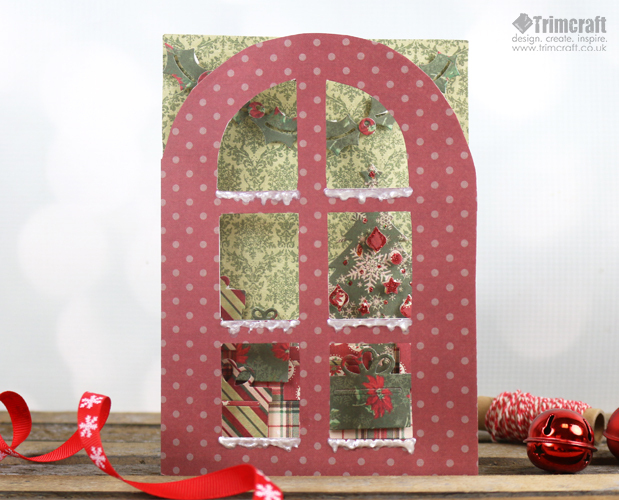 This wintry window card will look wonderful on a friends’ mantel piece this Christmas. Read on to find out how easy it is to make with our free template! 1. Print the free template and cut it out. Place it inside your Dovecraft 5x7 Card Blank on the left hand side, lightly draw around the shape and the aperture and carefully cut it out. 3. Adhere a piece of coordinating Winter Blooms paper to the inside, as the wall paper. Add a complementing piece of Winter Blooms paper to the bottom of the card to act as the floor. TIP – Line the paper used for the floor with the bottom window so that you'll be able to see the floor through the window frame. Cut off the excess paper. 4. Die cut a tree from the First Edition Christmas Tree Die Set, onto green Winter Blooms paper. Keep the baubles connected to the tree and adhere the tree with glue, along toward the top of the floor. 5. Die cut the tree onto a red paper design from the Winter Blooms collection. Add the baubles and stars from the tree die cut with 3D foam pads to the first tree. 6. Die cut the presents and holly from the same die set. Add the presents to the bottom of the tree, adding 3D foam pads to a few, to add dimension. 7. Make a garland across the top of the card with the holly and berries, using 3D foam pads to add dimension. 8. Add Dovecraft Red Glitter Glue to the decorations on the tree to make them sparkle! This enchanting window card really makes us feel really cosy! The Winter Blooms papers are so beautifully festive, this craft is sure get everyone in the holiday spirit! Your loved ones will be proud to display this handmade project in their home this Christmas.